Summary: Earlier statements had already signalled lower earnings for 2016/17, and these results were in fact CGS’s worst first-half figures for six years. The engineer still reckons lost work can be replaced, but the immediate outlook remains stagnant at best. The upcoming retirement of the chief executive brings some further uncertainty, too. Still, I don’t think good companies become bad companies overnight and the group’s long track record suggests a recovery will one day arrive. I continue to hold. June’s satisfactory full-year figures had already warned these first-half numbers would not be great. CGS said at the time that a “major contract” had finished at its machining division, and that the replacement work would not “come on stream immediately”. Then in August the group confessed within its AGM statement that it had “seen a softening in demand from our main customers”. In the event, first-half revenue dropped 11% while operating profit plunged 26%. Notably, revenue at the main foundry division slipped by only £1m to £54.2m, while the associated foundry profit was reduced by just £0.7m to £6.2m. A continued shift towards higher-value “more complex, machined parts” helped shore up that division’s performance. However, the loss of the aforementioned major contract pushed revenue at the machining division down from almost £10m to less than £4m. Divisional profit crumbled from £2.6m to only £0.8m. At least CGS reaffirmed the downturn should be temporary: “The introduction of replacement work remains on course for 2017/18 onwards”. All told, it was CGS’s worst H1 performance since 2010/2011. At least CGS continues to boast a cash-flush balance sheet. Despite paying a welcome £13m/30p per share special dividend during the half, cash in the bank remained at a sizeable £23m, or 53p per share. However, I note capital expenditure during the six months was a hefty £7m — no doubt due to those aforementioned “pre-production costs” in readiness for the replacement machining work. To put that £7m H1 capex into perspective, expenditure on tangible assets averaged £8m a year between 2013 and 2016. The books continue to carry no debt as well as a pension-scheme surplus (almost £15m at the last count). “The pension schemes are related parties of the group and during the period £919,000 (2015 – £1,139,000) was paid by the group on behalf of the schemes in respect of pension payments and administration costs. I am still unsure as to why CGS continues to pay money into the pension scheme when it is due to receive a refund. I did my best to deduce what is going on within this earlier Comment (point 5). Mr Gawthorpe has been a CGS employee since 1984, chief executive since 2007 and the lead executive since 2015. So I must say, it is a shame such a seasoned director has decided to retire. Nonetheless, his successor, Adam Vicary, appears to be a useful replacement. In particular, Mr Vicary has worked for foundry businesses since the age of 20 (he is now 48). Mr Vicary joined Chamberlin & Hill in 1988 and took charge of its foundry division in 2001. He then moved to CGS during 2010 and has since managed its foundry operations. The foundry operations at CGS have increased their revenue and profit by about 20% since Mr Vicary’s arrival. I hope that performance is a positive omen for his stint as group chief executive. 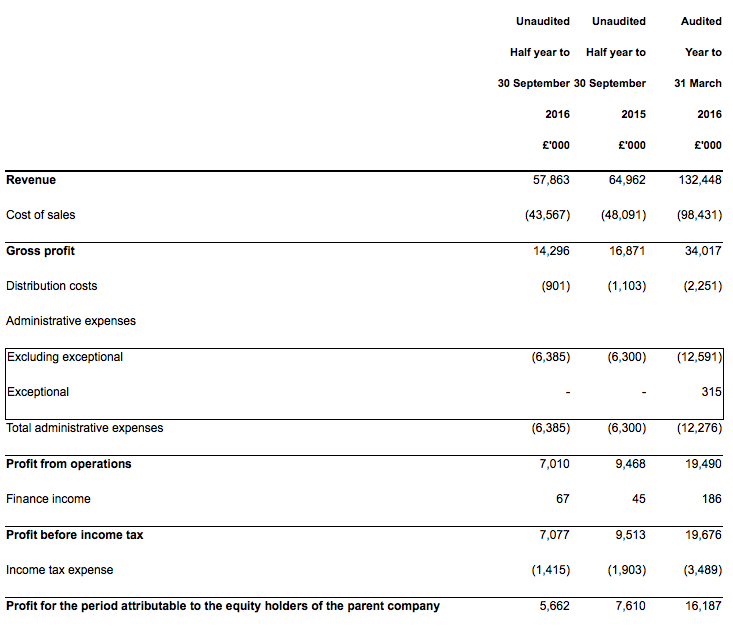 The trailing £16.7m annual operating profit after 20% standard tax gives earnings of £13.4m or 30.7p per share. After subtracting the aforementioned 53p per share cash position from the 390p share price, my estimate of CGS’s enterprise value (EV) comes to 337p per share or £147m. Dividing that 337p per share EV by my 30.7p per share EPS calculation gives a multiple of 11. That rating does not look wildly expensive to me, assuming earnings do indeed recover during the next year or two as the replacement machining work eventually comes though. …and yet by 2015, operating profit had rebounded to £19m. Finally, the interim dividend was unsurprisingly held at 3.38p per share to leave the trailing full-year payout at 13.71p per share. That payment supports a 3.5% income. I thought it a bit odd that there was no mention of the financial impact of Brexit or exchange rates in today’s report. The accounting small-print did not reveal any foreign-exchange gains, so perhaps there has been no effect. I noted in point 7 of this Comment that CGS’s disclosure about foreign-exchange movements was disappointing. Two-thirds of revenue during 2016 came from abroad.